New Delhi, Aug 14 (IANS) President Ram Nath Kovind said on Monday that Tokyo Olympics in 2020 offer an opportunity to raise the country’s standing in the worlds eyes and the people should absorb themselves for the next three years in the “national mission”. 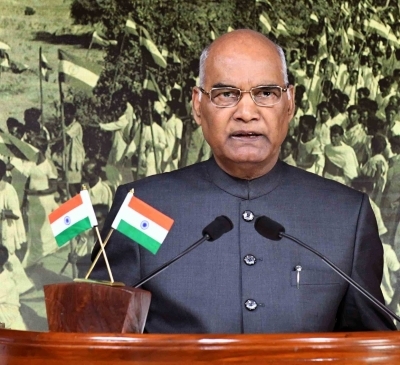 In his address to the nation on the eve of 71st Independence Day, the President said the citizens and children of India – whether living at home or abroad – must ask themselves how they can add to the country’s pride. “The Tokyo Olympics of 2020 offer another opportunity for us to raise our standing in the world’s eyes. Over the coming three years, we should absorb ourselves in this national mission,” he said. “Over the coming three years, we should absorb ourselves in this national mission. Government agencies, sports bodies and business enterprises need to join hands to identify and support our talented sportspersons and provide them world-class training facilities – so that they can be even more successful in Tokyo,” he added.